A few weeks ago during the Heatwave From Hell best-friend-K and I decided to check out Paladarr Thai Issan, a restaurant I'd heard about through the grapevine. It's in Alphington, a suburb I'd never been to until that hot, hot Wednesday evening (for the uninitiated, it's just past Fairfield on the train line). We were an hour late for our booking (b-f-K's car had been locked in the car park near her work, then train after train was cancelled so by the time we got there we were both hot and frazzled), but the extremely friendly staff at Paladarr had agreed to hold our table - just as well, as all other tables were occupied. Several glasses of iced water and a Beer Lao each and we were as relaxed as this guy. With a Good Food Guide chef's hat to its name, Paladarr Thai Issan is the latest baby of chef Chaloem Chaiseeha and his partner Bryan Derrick. 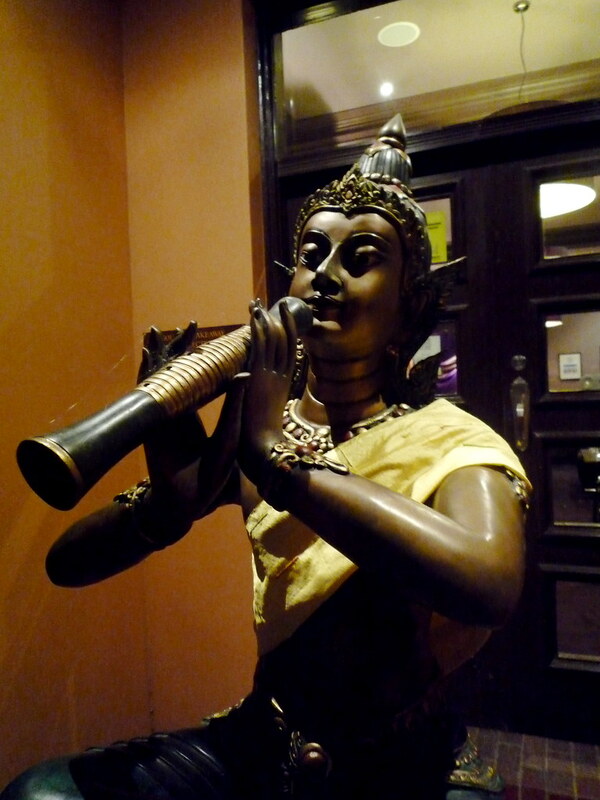 Upon entering it is immediately apparent how much love and attention they give the place, from the tasteful decor and beautiful courtyard to the mouth-watering menu (which features many interesting-sounding dishes, including Issan-style curries without coconut milk). I knew I loved this place even before I counted the number of times the menu uses the word "fabulous" (5. "Must bring DJ here!" I thought to myself). 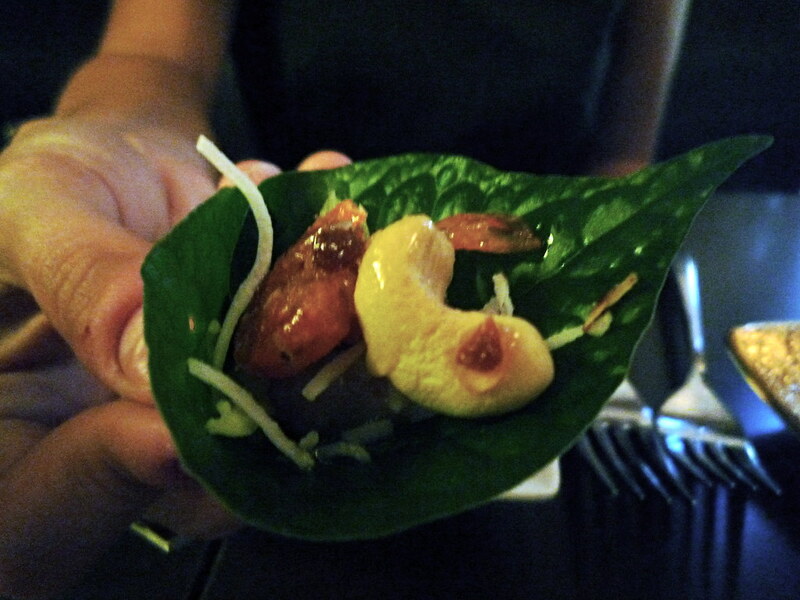 We started with Miang Karm ($8 pp), a construct-your-own appetiser of chapoo (betel) leaves into which you fold all sorts of goodies like pickled ginger, chilli, toasted coconut, diced lime, dried shrimp, diced red onion and cashews, topped with a tamarind sauce. B-f-K's hand is pictured below modelling a folded leaf. 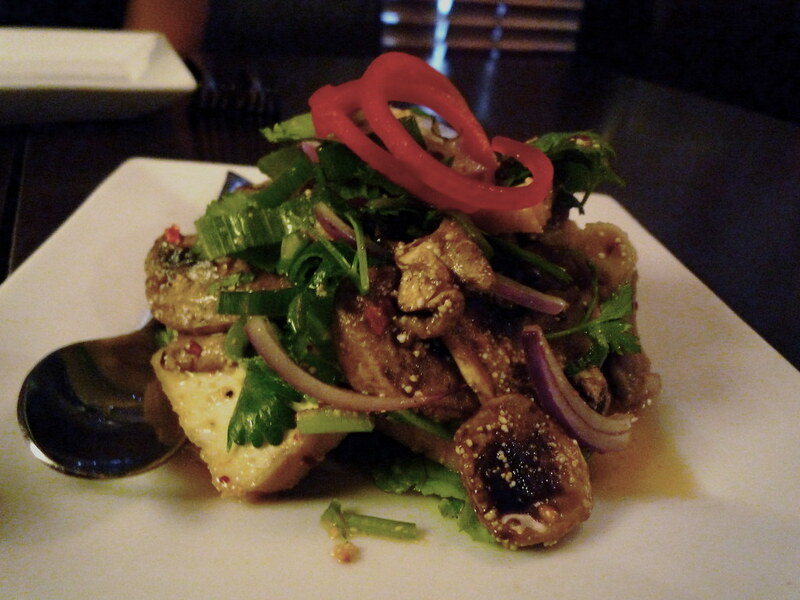 We shared an entree of Larb Thauhoo Hedt ($15), a salad of silky tofu and mushrooms mixed with coriander, spring onion, mint, chilli, lemon juice, fish sauce and ground rice. It was nice, but I wish we'd tried the crunchy salad of macadamia and cashew nuts instead - it looked fantastic. And then it was the red duck curry. Ah, the red duck curry. It's such a staple of Thai restaurants I felt almost guilty ordering it, particularly as there are so many unusual dishes at Paladarr, but what can I say? I'm a sucker for red duck curry. 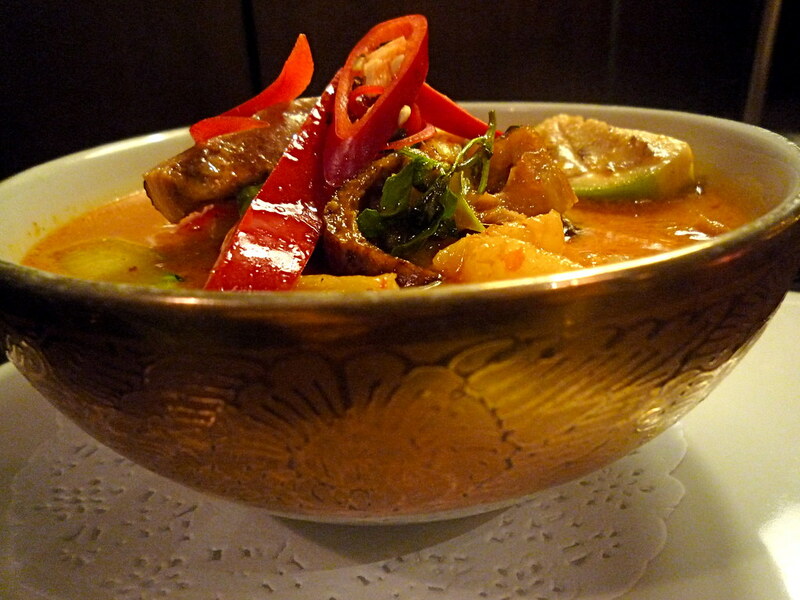 And this Kaeng Ped Bet Yang ($33) with pineapple, cherry tomatoes and Thai basil was EXQUISITE - the duck had been roasted to perfection! 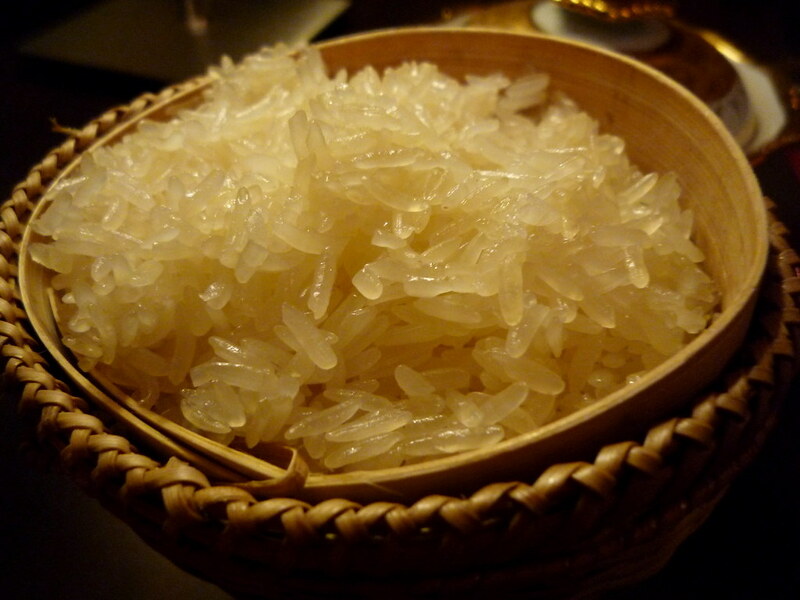 In addition to regular steamed Jasmine rice, Paladarr offers Khao Neeow (Issan-style sticky rice) and Khao Neeow Dum (black sticky rice), $7 each. 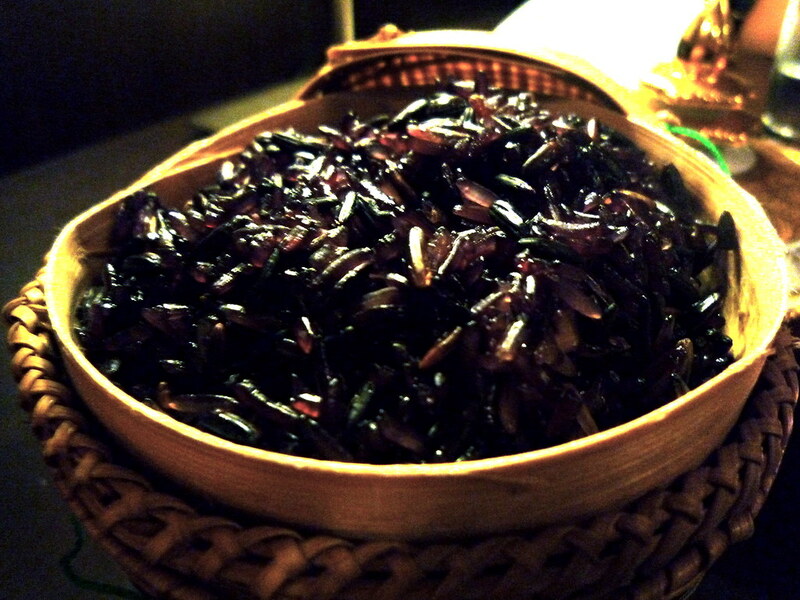 "You simply MUST try this traditional nutty fabulous rice", the menu enthused (sounding scarily like me when I get excited about something). 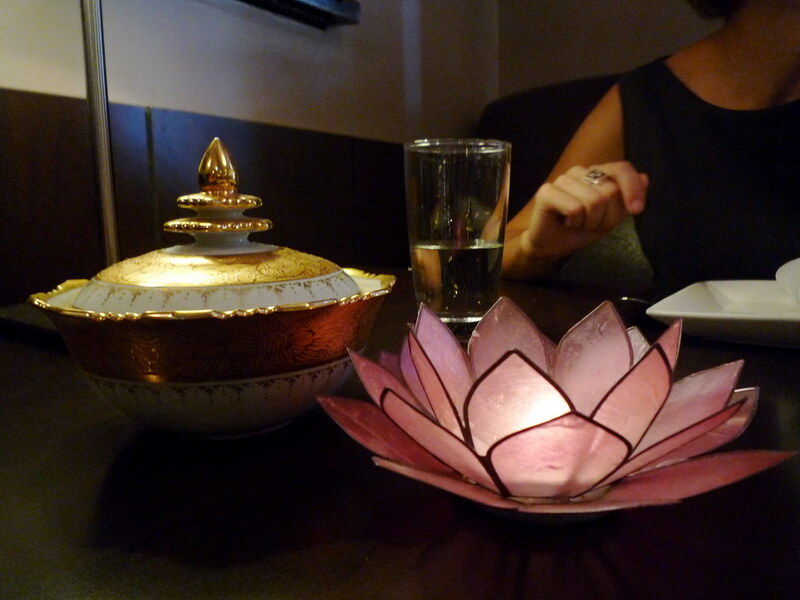 We dutifully ordered some traditional nutty fabulous rice, and were glad we had done so... both were, well, fabulous. 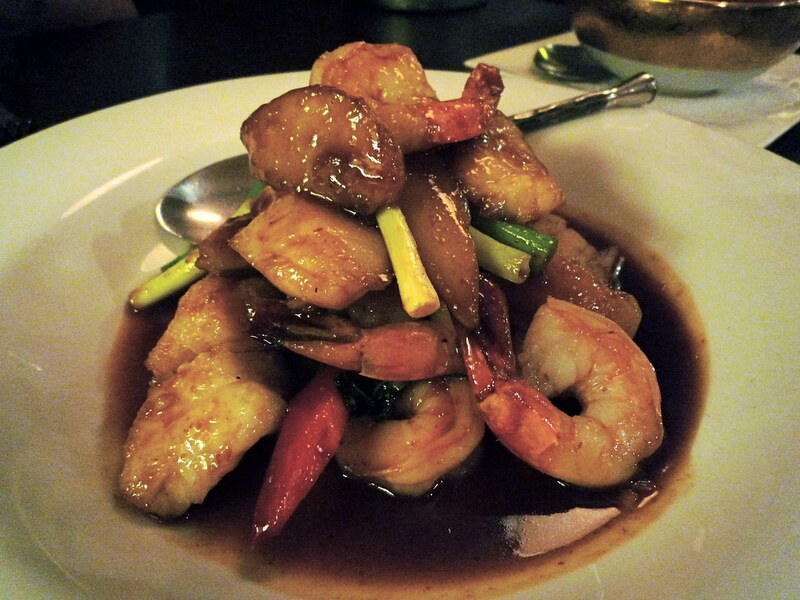 The other main we had was the Pad Ped Talay Pon Lah My ($35), an intriguingly fruity stir-fry of rockling, prawns, fresh pear and mango tossed in a light curry sauce. The mix of flavours was certainly unusual, but we both loved the way they tasted with the sticky sauce. I've very keen to head back to Paladarr Thai Issan soon to sample more of their dishes (preview them for yourself on their excellent website). Not only does Paladarr Thai Issan offer cooking classes with Chaloem, they also run culinary tours of Thailand. B-f-K and I have been half-planning a trip to Thailand in December, if only the next tour was then instead of September-October! Oh, that meal makes me swoon with absolute envy. That whole meal is exactly what I would have ordered. Will definitely be checking this joint out soon. 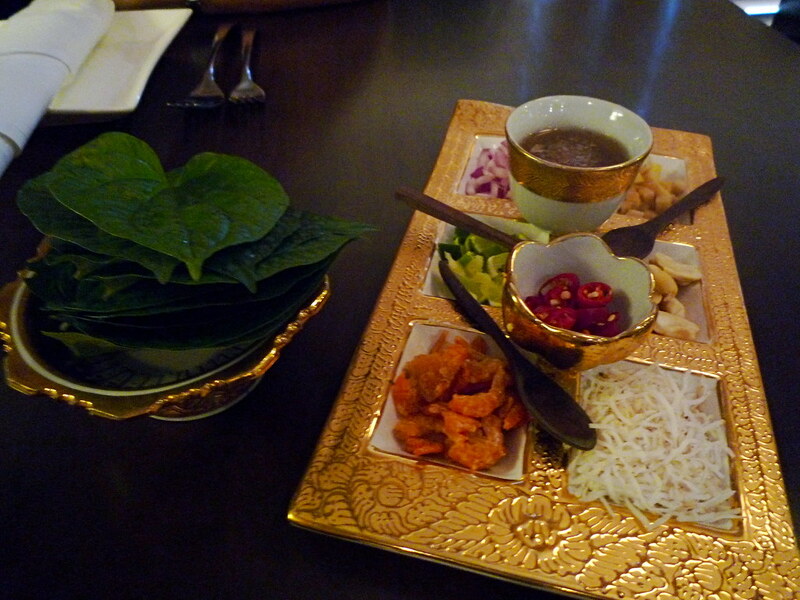 I first had Miang Karm at the Celador Restaurant in Bangkok and have been on the lookout for a place that serves it here. So many many thanks!!! I absolutely adore Betel leaves. My dad eats his with sambal belachan, and you can also cook them in a curry, what malays would refer to as "lemak", i.e. currey using coconut milk and usually yellowed with tumeric. Isn't it fabulous! I would say this is currently my favourite Melbourne restaurant. 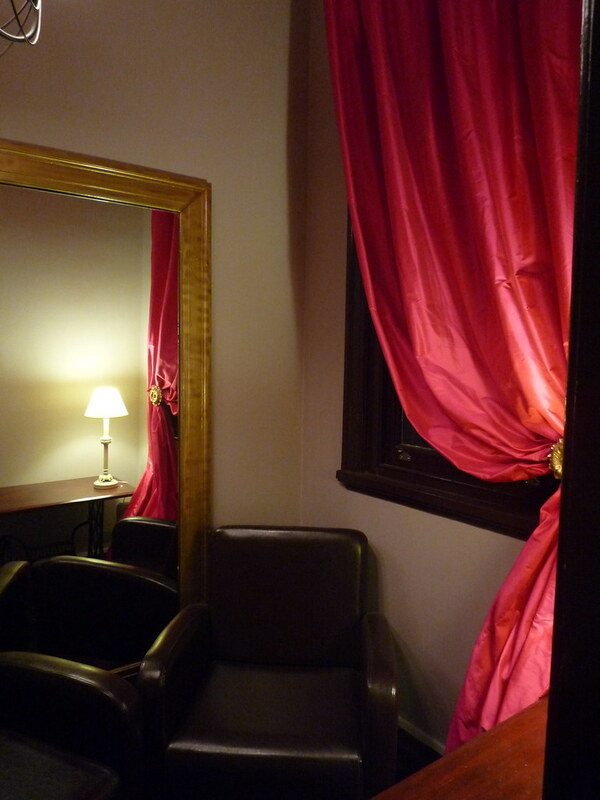 The food is simply exquisite, the service fabulous and those little courtyards are heavenly on a balmy summer evening. I've not blogged about it simply because I haven't felt I could do it justice. Hi Temasek - it's my pleasure to present it to you! Oooh, I love sambal belachan (especially with spinach or kangkung), sounds like it'd be great with betel leaves. Thank you Claire! Went last night with the other half. I'm another fan of the Betel leaves. And the duck curry was mouthwatering. The only flaw was the papaya salad. It tasted exactly like one I make at home. You don't want to be eating something you can make yourself! Otherwise a fantastic meal.